The journalist had been aboard the submarine before it sank. The turret of UC3 Nautilus is seen by the side of a salvage vessel during the operation. 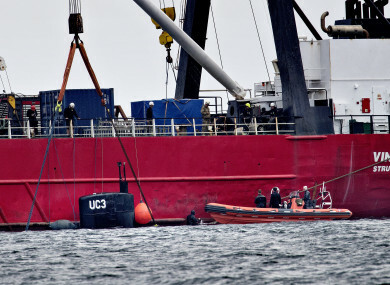 DANISH POLICE HUNTING for a missing journalist said they searched a huge homemade submarine that sank last week, but no body was found. “The sub has been searched and there is nobody on board — neither dead nor alive,” Copenhagen police homicide chief Jens Moller told reporters. The journalist had been aboard the submarine before it sank. The vessel’s 46-year-old inventor Peter Madsen has been accused of negligent manslaughter and was remanded in custody for 24 days. The vessel, the Nautilus, was refloated and towed to the Copenhagen port yesterday, then emptied of water overnight. Today police entered the sub and found it empty. Police have identified the missing journalist as Kim Wall, a 30-year-old Swedish woman who was writing a feature about Madsen. Nothing has been heard from her since Thursday evening when she boarded the sub with Madsen. Her boyfriend alerted police early on Friday that she had not returned home as planned. Madsen claims he dropped her off on the Refshaleoen island on Thursday evening after the interview. Early on Friday, Danish authorities announced they were looking for the Nautilus in waters off Copenhagen. Around midday on Friday, the vessel was located in a bay in Koge, some 50 kilometres south of the Danish capital. Just after being located, Madsen was rescued and the submarine suddenly sank. Madsen said in media interviews after his rescue that the sub encountered a problem with the ballast tank. However, Moller said it appeared as though the sub was intentionally sunk, amid media speculation that Madsen may have downed the vessel to cover up a crime. “It appears as though it was a deliberate action that caused the sub to sink,” Moller said. Wall is a freelance journalist based in China and the US. Her articles have appeared in the New York Times and the Guardian, among others. “We’re still hoping that we’ll find Kim Wall alive, but we are preparing ourselves for the fact that she may not be,” Moller said. Madsen made headlines when he launched the 18-metre Nautilus in 2008, at the time the world’s biggest homemade submarine. Email “Danish police search homemade submarine but don't find body of missing journalist”. Feedback on “Danish police search homemade submarine but don't find body of missing journalist”.